And a Happy Birthday to you as well, Tech101! I can say that cause it's already your birthday here in Australia. I'd like to wish a Happy Birthday to Tech101, and anyone else I may have missed recently. ...to you, visicalc and snarkist! to gamerace sorry for not catching your birthday when it happened. Happy birthday GamerZackX I hope I wasn't too late. Thank you for the wellwishes everybody! Happy Birthday GamerZack I hope you have a good one! Rukiafan wrote: Happy Birthday GamerZack I hope you have a good one! @Rukiafan @Sinon Thank you so much! 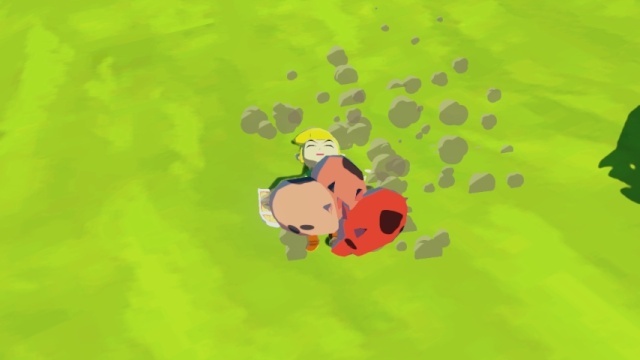 I hope that you are having a better day then Link is! @Kushi-chan @Nate-kun Thank you so much! Link looks like he's in a bit of a pickle there! Man, it's this time again! So have you received any Nintendo goodies as gifts, @Rukiafan? eshop credit and a Wii U Pro Controller. Btw my birthday isn't till next Thursday though. On a side-note WiiWareWave turns 4 tomorrow do you think that you can whip up an anniversary article for WiiWareWave's big day @GamerZack87?! Rukiafan wrote: eshop credit and a Wii U Pro Controller. Rukiafan wrote: On a side-note WiiWareWave turns 4 tomorrow do you think that you can whip up an anniversary article for WiiWareWave's big day @GamerZack87?! Rukiafan wrote: Thank you my friend. You're welcome. And it's already done. By the way, shall I also do a birthday Matter of Opinion, where various characters share their own special birthday messages? Gadd: Yabo Yabo you're spoiling @Rukiafan! Rukiafan: That would be awesome!!! Wait why is professor Gadd here? Awesome! I'll get to work on it in a while. Stay tuned! @Sneaker wrote: Happy belated birthday Rukiafan. Actually, I think his birthday is still a few days away, @Sneaker, so you're not too late. You were two days late, but thanks nonetheless my friend. Happy Birthday @Kushina I hope you enjoy your present and have a very wonderful day. Happy Birthday @Gamergy! I hope your day was good and your gifts were plenty! @GamerZack87 I know it's not your birthday, but be sure to check your PM's. Thanks for the birthday wishes, it was a fun one! @SKTTR @GeekyGamerZack Thank you, my friends! My birthday's next Thursday! Yay!